1. Use rice flour for rolling out dough. While there are lots of ways to roll out dough, in general, the rule of thumb is to use as little flour as possible to avoid a tough crust and/or working too much flour into the dough. Yet flour is necessary for rolling, so it can be challenging finding that sweet spot between too much and not enough. Rice flour is no different to work with than regular flour when rolling pie dough. Just sprinkle it on your counter and rolling pin, then roll. It has a slightly sandy texture but still behaves like a fine powder. The kitchn folks also said cornstarch and powdered sugar work well if you don't have rice flour on hand. And you can also just roll your dough between 2 sheets of parchment if you don't want to bother with any of this. But the favorite method is the rice flour because of the added crispiness it gives the baked crust. 2. Avoid those soggy bottomed fruit pies. First, use the right thickener. 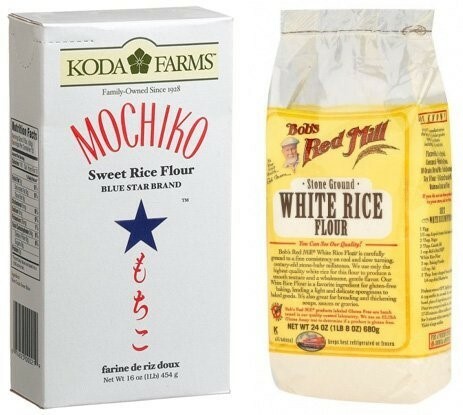 Flour, cornstarch, and quick-cooking tapioca are the most popular thickeners. Cornstarch has a nice smooth texture and no real flavor, but it can lead to an occasional murky color with berry pies and its thickening power is compromised with high acidity fruit like cherries. Quick-cooking tapioca will never result in a cloudy filling and soaks up really juicy fruit the best. However, it's temperamental in that it NEEDS high heat to activate completely. Make sure to give your pies a good ten minute dose of heat at 400 F if you're using this thickener. Flour is an easy thickener in that you generally always have it on hand and it works beautifully. 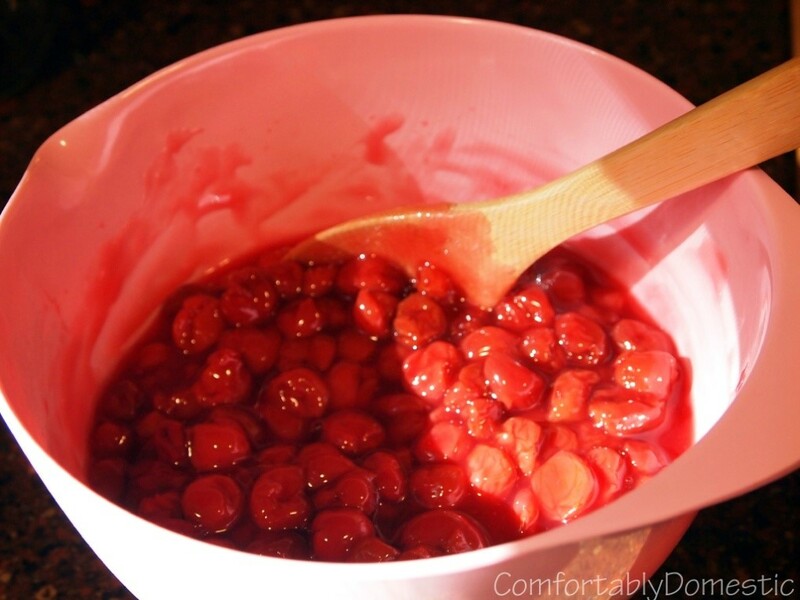 It can lead to a gummy, cloudy filling with delicate summer berries though. It's best to reserve thickening with flour for heartier fruits like apples and pears. Next, pay attention to bake times. 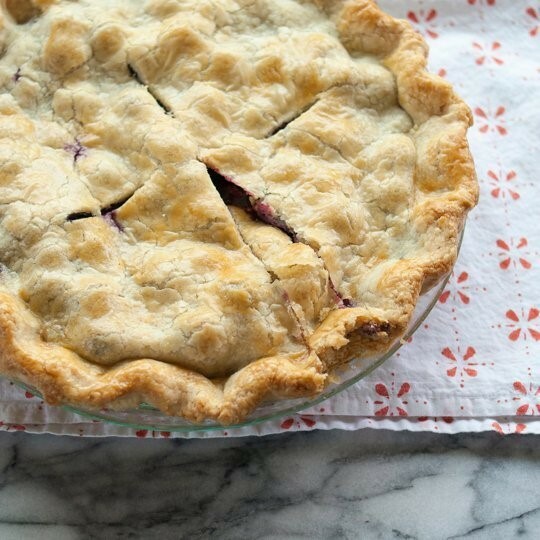 Not enough bake time and you'll have a runny fruit pie, so give it ample time. Any thickener you use needs a little time to set up, so don't be fooled by crust turning light brown and think the pie is done when it's really not. And when making filling from fresh fruit, l et it sit in sugar for half an hour and drain the natural juices that gather. This is especially important for peaches or strawberries. Also, consider sprinkling graham cracker crumbs inside your bottom crust; they soak up some of the juices released from fruit during baking. •Size matters: An 8-9" pan consistently turns out the best pie. Those ranging from 9 1/2"-10" produce deep, sloppy pies. • Pre-baking:Aluminum pans (not a favorite of the pros), conduct heat well and also cool quickly, making them a good candidate if you're pre-baking or blind-baking your crusts. • Dispose of "Disposable Aluminum": They interfere with the even temperature of the pie crust and produce a pie that could be much better if it were baked in a substantial dish. • Glass is the best choice: It takes its time to heat and heats evenly, making it perfect for virtually any pie you're making. 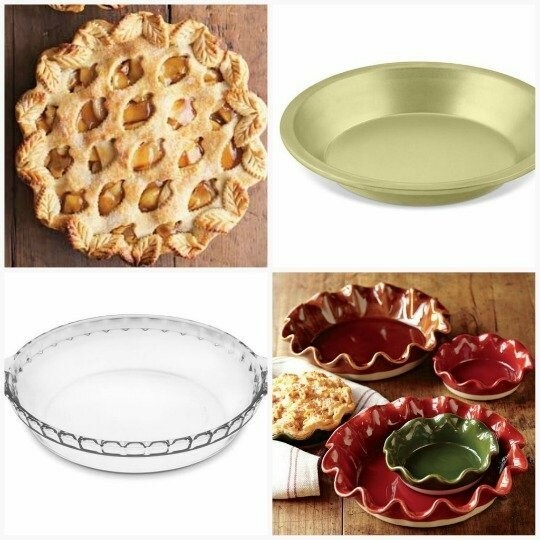 • Ceramic Pie Dish: The Emile Henry dish is a big favorite because it always produces beautiful pies and can go straight from freezer to oven, which is handy because if you want to freeze your fruit pies before baking them. • Pyrex: Glass heats slowly and allows heat to build gradually and spread evenly, so a Pyrex dish is the go-to plate for most pie bakers. 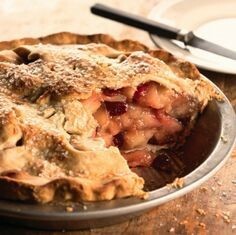 Bottom-crusts on fruit pies come out crisp and custards cook evenly. The 9" standard dish (rather than the newer 9½" scalloped plate) is preferred. The 9½" dish is too deep and difficult to cook a fruit pie without getting sloppy. • Sturdy Aluminum: Chicago Bakeware is the choice here. The folks at thekitchn.com use the basic pie pan for blind-baking crusts and doing simple graham cracker or cookie crusts. 4. Always make a sacrificial slice. The first slice is always the hardest to get out of the pan. Always. It disappointingly crumbles, smooshes, and collapses on the plate. The obvious solution: the sacrificial slice. You can argue that the first piece of pie is always the sacrificial slice, which, though still tasty, is set aside while the prettier slices are passed out. But a more economical solution? Just cut the tiniest sliver of pie as your "first slice" and then cut the rest of the pie into normal-sized wedges. This way you can get under the slice and lift it cleanly from the pan, without wasting an entire serving in the process. BTW: This approach works not only for pies, but for brownies, casseroles, and anything else that's hard to get out of the pan on the first go-round. And finally: The sacrificial slice that gets set aside in favor of grander, more show-worthy pieces? If you want to hide it somewhere and rename it "midnight snack," I won't tell a soul.